On June 23, 2007 in Vancouver, British Columbia, I was honored to give the keynote presentation at the second annual Contextualized Attention Metadata Workshop (CAMA 2007). This event, part of the Joint Conference on Digital Libraries (JCDL 2007), was very well organized by Erik Duval, Jehad Najjar, and Martin Wolpers,all from KU Leuven University in Belgium, and was additionally sponsored by the ARIADNE Foundation, ProLearn and MACE, each of which are worthwhile projects in the European Union. I recommend you check them out. Contextualized attention metadata (CAM) captures the data on attention that a user spends on resources in a specific context. CAM enables us to better support the user in dealing with the information flood. Using CAM, filters can be devised that present new information only in the relevant context, for example by prioritizing incoming email based on the attention previously given to the topics of the email. Furthermore, CAM data can extend and amend user profiles thus enhances personalization in existing systems. CAM streams are collected from all applications that a user may interact with, including digital libraries, office suites, web browsers, multimedia players, computer-mediated communication and authoring tools, etc. I’m sure you can add a few other words after “just the right” to improve this even more, but you get the idea. The latest dating technology, which is very good at helping you find just the right person and by changing the context of romance works equally as well for finding just the right person for any other purpose. And I’m sure you can come up with many more examples. This concept is easy to grasp, but turning it into reality is a healthy challenge. Figuring out what is “just right” for each of us at any given time and in any situation is no small task, and yet, progress is being made. Focusing on CAM will make it happen that much faster. Below, you can view the slides I used to support some of my comments at the workshop and download them directly from my Slideshare site. What I took away from Joe Pagano’s presentation, "Measuring audience attention across multiple channels for a new Web site" was their finding that every site is unique (the Snowflake Effect) in terms of how best to attract the most attention. In the example cited in the paper, they measured audience attention across multiple channels for a new web site Chronicling America, introduced in March 2007. 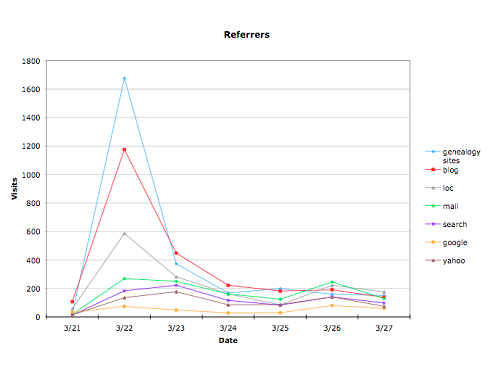 Interestingly, for this site and audience, “online word of mouth”(OWOM) referrers were the most significant sources initially driving discovery of this site (see the following chart). In particular, what they called “genealogy sites” (e.g. obituaries) scored the highest, followed by blogs, referrals from the Library of Congress site, e-mail, and lastly, search. It is likely that over time, search will become more effective as the more links to the Chronicling America site help to increase the site’s ranking, and this pattern is already suggested in the chart. However, as Joe concluded, it also shows how OWOM plays a critical role, especially in the initial phases of the introduction of a new site or new content. Seth stressed the importance of adopting and respecting the fundamental principles of attention: property, mobility, economy and transparency. He also made the interesting remark that “attention is now media”. By this he means that streams of attention, where people choose to stream/broadcast/share their attention to things like music through Last.FM, to web sites through del.icio.us, and to photos through Flickr, are now growing exponentially. You can see a tangible form of this “attention funnel” in Reblog, which is an “RSS aggregator for reading and republishing”. Reblog makes the process of filtering and republishing content from many RSS feeds easy and fast. Rebloggers subscribe to their favorite feeds, preview the content, and select their favorite posts. These posts are automatically published through their favorite blogging software, creating an attention funnel. Seth posted an intriguing blog entry last year about how “APIs are the printing presses of social media”. However, one of the more provocative observations that Seth made was his assertion that what drives online behavior is “vanity and popularity [which are] more powerful than things that help me” and that “publicity is trumping privacy.” Attention is one of the scarcest of all resources and we all want more of it! You can think of this as “attention in reverse.” Most of the work on attention is based on YOUR attention, what are YOU interested in, paying attention to, etc. Seth was noting the inverse; in his opinion, an even more powerful force is our interest in “Who’s paying attention to ME?” We see this with such things as the great importance given to knowing how many people are reading my blog, visiting my web site, watching my YouTube videos, who has the most online “friends”, etc. One recent example you might like to look at is atten.tv, which lets you either broadcast your clickstream to the world or watch what others are clicking on, all in real time. Seth sometimes refers to all this as the "Attentron”, which he describes as “watching people’s browsing patterns as entertainment.” Seth has created his own version of this with Trakzor, which is a community driven MySpace tracker that lets you see who’s checking you out. This capability is also available on Facebook. And while it is all rather wild at this early stage of development, it is worth noting that Yahoo! purchased mybloglog.com, which lets you see who else has been looking at your blog. While I agree that this “attention in reverse” is a version of the very real human traits of ego and vanity, I’m not yet convinced that these are more powerful forces than the value we place on people and other sources of assistance—things that help us. But I do believe that “enlightened self interest” is both a powerful and very positive driver. The capture and management of context and attention metadata is key to harnessing this power and getting us ever closer to the vision of “just the right” and the Snowflake Effect. My recommendation is to keep your eye on developments in these areas of context, attention and automated metadata and to do as much “learning by doing” as you can so that you have experiences of your own to reflect upon as you try out whatever versions and applications of attention and context tracking you prefer. I wonder if you have heard of Attention Profiling Markup Language (APML). It touches on many of the issues you mention here.